Antique - Fenton Jackson & Gosling Fine Bone China Tea Set. 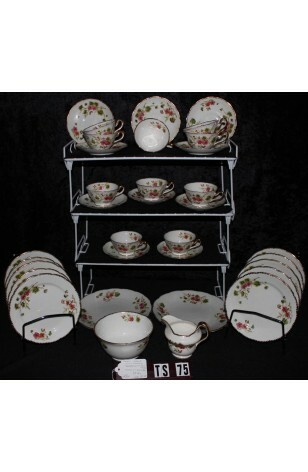 A 34 Piece Set, Service for (10) Ten, in the "Geranium" Pattern #4594, Made in 1912. A lovely Antique Fine Bone China Tea Set for Ten in the :Geranium" Pattern by Jackson & Gosling of Fenton, England. This is a Scalloped White China with Pink & Rose Geraniums, 3-toned Green Leaves, along with 22kt Gold Rims and Dots below the Rim. A beautiful Pattern for both Formal and Casual Use. Floral Bouquets are on the inside of the Cups and the Sugar Bowl also. A lovely Antique Fine Bone China Tea Set for Ten in the :Geranium" Pattern by Jackson & Gosling of Fenton, England. This is a Scalloped White China with Pink & Rose Geraniums, 3-toned Green Leaves, along with 22kt Gold Rims and Dots below the Rim. A beautiful Pattern for both Formal and Casual Use. Floral Bouquets are on the inside of the Cups and the Sugar Bowl also. In Great Resale Condition unless noted below or in pictures. 10 - Saucers - 5 7/8"